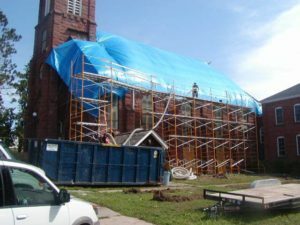 Storm Damage - Lindstrom Cleaning & Construction, Inc. Living in areas such as Minnesota and the surrounding states, we have experienced many devastating storms that can cause a magnitude of damage in a matter of seconds. Tornadoes, lightning, hail, wind, and rain can all cause many different types of damage to your home or property. Each situation should be carefully analyzed by an experienced industry professional. If your property has sustained storm damage, call Lindstrom Restoration and your insurance company right away to assist you with the investigation and restoration process. If your home has suffered a lightning strike and there has been a fire as a result, please see our fire damage restoration section. If your home has suffered a flood because of heavy rain, please see our water damage restoration section. Immediately call Lindstrom Restoration at 763.544.8761 for our emergency restoration services if either of these events have occurred. Hail will mainly cause damage to your roof, siding and windows. Checking your roof each year for hail damage can help prevent future damage caused by rain. If you notice dents or holes on the siding, roofs, or screens of your home, call Lindstrom Restoration and your insurance company right away. After the storm, check for water stains around and under your windows, which may be a result of leakage. Also, be sure that you do not have any broken windows. If you have suffered a broken window, especially if the room is carpeted, keep your family and pets out of that particular room, in case there is broken glass embedded into the carpet. Report and stay away from any downed power lines.